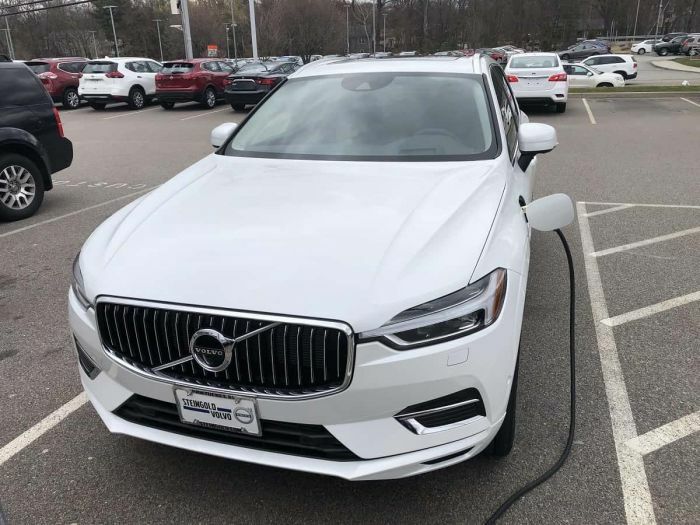 Yesterday I was at Steingold Volvo on the Attleboro/Pawtucket line on the Massachusetts/Rhode Island border and tested out the Volvo XC60 PHEV: Sweden's junior PHEV rocket ship. The Volvo XC60 is the “inscription” model with all the bells and whistles priced a little over 67k. The base model “momentum” version starts a little under 53k. This does not include the federal tax credit of $5,002. There is also a state credit depending on where you live. When I arrived the vehicle was almost fully charged. There is level 2 on site at the dealership. Within a few minutes I was behind the wheel and headed for interstate 95. First off a little more about the car. The Volvo XC60 is slotted below the XC90 which is also available with the same PHEV powertrain. It is similar in size to the Toyota RAV 4 and Honda CR-V and would complete directly with the BMW X3. The EPA rates the car at 18 miles in all electric mode and 59 MPGe. While running as a hybrid, the car is rated at 26 mpg combined. I hope to do some steady state testing next time. During my testing, I saw speeds of 75 mph in EV mode. Acceleration in electric mode is brisk enough with the 87 hp electric motor and should be fine for most daily driving situations. Floor the accelerator in EV mode and both sources will kick in for maximum power. Total output is 400hp and 470 ft/lbs of torque. According to car and driver, 60 mph arrives in just 5.1 seconds, which is impressive for a 4,822 lb vehicle. The car has a 10.4 kWh lithium ion battery pack. If you plug in at home and at work, that is 36 miles all electric per day right off the bat. I hopped on to 95 north in EV mode and had no problem keeping up with traffic in all electric mode. There is a needle indicator which tells you how hard you can push the throttle and stay in electric. Push the needle past the fuel drop indicator and the engine comes on. Stay below the lighting bolt indicator and you will be all electric. With no traffic in front of me, I nailed it and very quickly hit 124 mph. The car had plenty more to go and is definitely worthy of autobahn cruising although I would hold on very tight at those speeds. Top speed is capped electronically at 130 mph for US versions according to car and driver. Cruising at 70-80 mph, the car felt very solid and still felt stable even at 110 mph. According to my decibel app, the interior volume averaged 79 decibels crusting at 70 mph. There was a 12 mph cross wind. The initial drive to the charging station at Boch Nissan of about 9 miles gave just 19.2 mpg. However, This included a 124 and 110 mph blast, and a 0-80 acceleration run. Drive it hard and fuel economy will suffer. Drive more conservatively and plug in at home and at work and you will be very happy with the results. Like any powerful car, things can get out of hand very quickly. As with any plug-in hybrid, your mileage will vary greatly depending on your driving and charging habits. Towing capacity is 3,500 lbs. Regenerative braking wasn’t the best, but putting the car in B-mode did help although calling it one pedal driving would be a bit of a long shot. The 8 speed transmission shifted smoothly and the tachometer showed 1,800 rpm at 70 mph in top gear. The tach is only visible in sport mode and sport mode unfortunately prevents EV only operation, even under light throttle. In normal mode, the indicator will even show you when you tap into the physical brakes. While there is a manual mode, it only allows manual downshifting. Tapping the selector back up simply puts you back into automatic. I did not spend any time with the adaptive cruise control and pilot assist. I plugged in for about 10 minutes or so at the level 2 at Boch Nissan while getting some photos and video. The charge port is located on the driver side quarter panel. The charge rate is 3.5 kWh and a full charge comes in about 2.5 hours at level 2. A portable, level one charger is also provided. The heated leather seats were comfortable and I had plenty of room in the back seat with the driver seat in my comfortable driving position. The rear seats split fold flat an there is no compromise over the gas version in rear seat comforts. The model I drove came with the panoramic moon roof. With temps around 50, I didn’t spend any time with it open. The backup camera is excellent and has multiple views, with or without lines. The Tesla like touch screen will take a bit of time to learn. The Prius Prime has a similar set up and many other cars are available with a relatively big screen. Use the rotary knob on the center console to select between the drive mode as shown in the photo below. The energy screen is pretty simply once you get used to it and clearly shows whether you are using, electricity, gas or both. The display shows MPH and Kilowatts per mile. You can set the graph resolution for 1, 10, or 100 miles. The screen also controls the audio. The car has both android auto and apple CarPlay, but I did not hook my phone up on this drive. I was not specifically impressed with the navigation graphics but I will spend some more time with that next time around along with the audio system and apple CarPlay. The scene also has a tire pressure monitor but I only saw green dots on all four tires and not a specific pressure. I will look more carefully next time. The oil level can be checked using the screen as well. On the drive back, I drove much more conservatively and got much better results. Next time I will do some steady state testing. I averaged 56 mpg experimenting with both EV only as well as hybrid mode with temps in the low 50s and a 12 mph cross wind. As I said earlier, your mileage will vary greatly depending on commute length and how often you plug in. I have yet not driven the gas only versions for comparison. The least expensive gas version has 250 hp and is rated at 28 on the road and 22 in town. For someone who is not concerned about luxury, the Mitsubishi Outlander PHEV is a much less expensive option and has a slight longer EV range of 22 miles. Another option is the Kia Niro PHEV which is rated at 26 miles all electric but is a bit smaller than the Volvo and the Mitsubishi. Overall this is an excellent PHEV option for someone who is looking for a luxury SUV but doesn’t need or want the larger XC-90 model. When plugged in regularly, most users will significantly reduce their fuel consumption over any other luxury suv this size. I wish Volvo would do a plug-in version with a much less powerful but more efficient engine for better long trip fuel economy. I don’t think 400 hp is necessary in a small suv but at least give the customer an option. That being said, 0-60 in 5 seconds or so is a lot of fun, I will have to admit... One more thing, I wish Volvo would also be a little less discreet when it comes to badging. Currently the average person on the highway will not notice anything different over the regular version. It doesn’t even say plug-in hybrid anywhere. It’s just says T8, “twin engine” in tiny letters. The average person is not going to realize what that means.